Following her attendance at the ABC Upfront, Tracee Ellis Ross posted her look to instagram ahead of her attendance at The Paley Center for Media Honors: Celebrating Woman in Television in New York yesterday evening(May 17th). 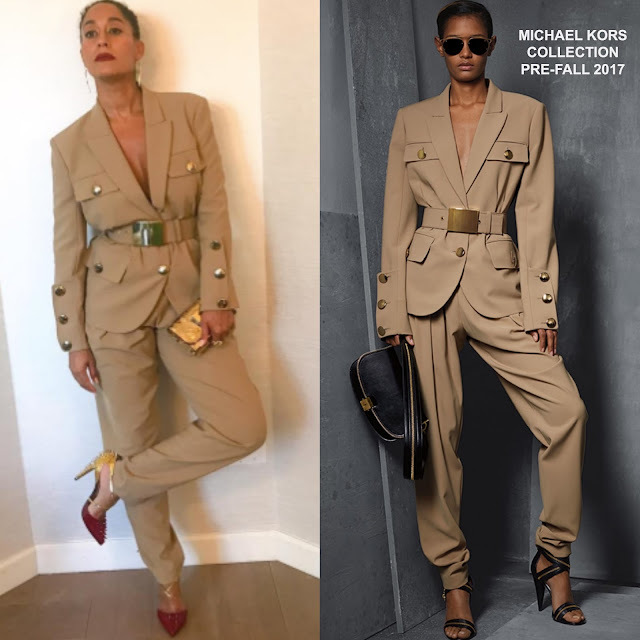 She posed for the gram rocking a MICHAEL KORS PRE-FALL 2017 khaki suit which featured a belted waist, gold button detail jacket and the matching trousers. Pops of color came via her red lip and CHRISTIAN LOUBOUTIN gold & red T-strap spike pumps. Vintage NEIL LANE jewelry, a gold JIMMY CHOO clutch and a pulled back bun finished up her chic, safari inspired look.